The past year has witnessed unbelievably impressive results for Vietnam’s tourism industry, with a record 15.6 million international visitors and 80 million domestic tourists, and total tourism revenue of VND620 trillion (US$26.95 billion). In order to achieve these outstanding results, the airline industry has made an important contribution. The December revelation of co-operation between Thien Minh Travel JSC CEO Tran Trong Kien, and AirAsia Group counterpart Tony Fernandes, to develop in the Vietnamese market caused quite a stir among investors and brought joy to many Vietnamese people. Thien Minh Group has already strongly invested in the aviation sector since 2014, although its last dip into Vietnam failed to materialise. Meanwhile, Malaysian-based AirAsia has three times previously attempted to penetrate the Vietnamese market, notably with the signing of an unsuccessful strategic partnership with budget carrier Vietjet eight years ago. But these blips did not force the two CEOs out of the game. While Kien shared that every experience is special and gives him motivation to try new things, Fernandes asserted that Vietnam is the latest country to lure AirAsia, where this brand operates through a joint venture in low-cost aviation. “If AirAsia wants to be a true airline of Southeast Asia, we must affirm our presence in Vietnam,” Fernandes told the Vietnam Travel and Tourism Summit 2018. This return of AirAsia is demonstrating the open-sky policy of Vietnam after the country decided to allow 71 foreign airlines from 28 countries and territories to operate in the domestic market. In mid-2018, the Vietnamese aviation industry also recognised the appearance of a new private airline owned by FLC Group, Bamboo Airways. Together with four other airlines currently operating, namely Vietnam Airlines, Vietjet, Jetstar Pacific Airlines and VASCO, Bamboo Airways aims to provide customers with access to high-quality, affordable aviation services with flights to FLC resort-based destinations in Quy Nhon, Quang Ninh, Quang Binh, and Thanh Hoa. Dang Tat Thang, deputy general director of FLC Group and CEO of Bamboo Airways, said that by 2023 the company will operate over 24 domestic flights and 16 international flights connecting Vietnam with Asian countries such as the Republic of Korea (RoK) and Japan. The positive change in Vietnam’s aviation industry is also reflected in the emergence of Van Don International Airport in the northern province of Quang Ninh, the first airport in Vietnam to be developed by the private sector. The Vietnamese aviation market is also serving 71.4 million passengers, an increase of 15% compared to 2017. 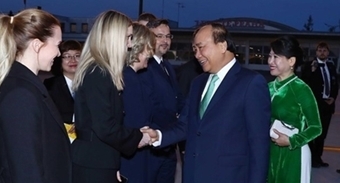 These impressive results have set the path for promoting the Vietnamese tourism industry to develop strongly in the past year, with aviation and tourism being two closely-interconnected economic sectors. Accordingly, 70-80% of passengers transit by plane with the purpose of travel and the number of tourists to Vietnam by air also accounts for a similar proportion, according to statistics from the Vietnam National Administration of Tourism. In comparison, in Thailand, the tourism powerhouse of Southeast Asia, the aviation industry has developed strongly with more than 30 airports operating regularly, with over 10 international airports and 15 domestic airlines. Thanks to the diversification of flight routes, flight frequency and cost reduction, Thailand’s aviation has become one of the important factors to help the tourism industry grow. In 2017, the country welcomed 34 million international tourists and more than 50 million domestic tourists with a total revenue of US$74 billion. Thailand is investing tens of billions of dollars to upgrade existing airports and open new ones, enabling airlines to operate smoothly and more easily. The development of the aviation market has boosted growth of Vietnam’s tourism industry. Data from the International Air Transport Association shows that Vietnam was the world’s seventh-fastest growing aviation market in the 2013-2017 period, and will become one of the five fastest-growing markets globally in terms of additional passengers annually by 2035. The Civil Aviation Administration of Vietnam forecasts that the number of air passengers may reach 142 million by 2020, which means on average a growth rate of 14% during 2017-2020. Recognising the positive effects generated by the aviation market, some Vietnamese tourism enterprises have combined with domestic and international airlines to open more charter flights to attractive tourist destinations in Vietnam as well as bringing local tourists to famous tourist destinations across the world. Serving the transportation demand of customers, some major travel companies such as Vietravel, Saigontourist, Ben Thanh Tourist, Vietnam Travel, and TransViet have co-operated with carriers and localities to organise charter flights. Many localities, including Can Tho, Quang Binh, and Nghe An, are willing to support and even compensate losses for carriers, and offer tour operators charter flights aiming to lure more tourists. Vietnamese airlines are also enthusiastic to enter the business through the lease of aircrafts and offering attractive incentives for tour operators. Tours using air charters are flourishing, and low-cost carrier Vietjet is taking advantage of this opportunity. The revenue of Vietjet from leasing air charters has sharply surged from VND412 billion (US$17.9 million) in 2014 to VND2.63 trillion (US$114.4 million) in 2016. On average, one in every four flights is by charter. At the beginning of 2016, Vietnam Airlines had leased three Airbus A350 aircrafts that were handed over in the 2016-2017 period. According to the information from Jetstar, the rent of charter flights is quite modest on the domestic routes, but much more on foreign routes. The introduction of charter flights brings a large number of visitors to the country, especially major domestic tourist cities. The flight from Danang has connected with 20 destinations worldwide, including 14 charter flights to the largest cities in China. Nha Trang also attracts foreign visitors thanks to charter flights, most of whom are Russian and Chinese. In addition, other routes have been evaluated with the launch of flights such as Can Tho, Dalat, Danang and Hue to Bangkok, and together with some routes to China and Russia, which have been successful in numbers of guests. According to the Vietnam National Administration of Tourism, the country welcomed 15.6 million international visitors and 80 million domestic tourists across 2018, with the total tourism revenue of VND620 trillion (US$27 billion). The total number of international arrivals to Vietnam has doubled over the last three years. Vietnam is ranked sixth among the world’s 10 fastest-growing travel destinations by the United Nations World Tourism Organization, and is also honoured as one of the world’s top destinations. This is the premise for the Vietnamese tourism to reach the goal of luring 18 million international tourists, welcoming and serving 85 million domestic tourists, and achieving the total revenue of over VND700 trillion (US$30.4 billion) from tourism in 2019.